If you're keen for that new car, caravan or boat we can help you out. Get in touch and we'll tell you how. Bank of us lending criteria, terms and conditions including fees and charges apply. Full details are available on application. 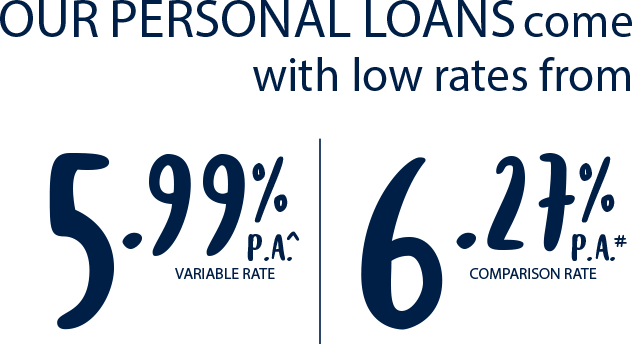 ^Rate available for new personal loans secured by boat, motor vehicle, caravan or motorcycle up to 2 years old and subject to change. #The comparison rates are calculated on the basis of a secured loan of $30,000 over a term of 5 years. WARNING: These comparison rates apply only to the examples given. Different amounts and terms will result in different comparison rates. Costs such as redraw fees or early repayment fees, and cost savings such as fee waivers, are not included in the comparison rate, but may influence the cost of the loan. What is your net fortnightly income?